The brand introduces its first menswear collection. In the south of France, “Le Gadjo” is local lingo for “boy” or “guy”. And the phrase couldn’t be more fitting as they spilled out in numbers onto a secluded beach outside Marseille, as Jacquemus unveiled its first menswear collection for SS19 (titled the very same). Since the 28-year-old French designer’s first namesake collection back in 2013, quality has been at the forefront of Simon Porte Jacquemus’ designs. The main women’s line has become instantly recognisable for its signature cotton shirts and linen, and now, for the men’s, it’s certainly no different. Think wool’s a winter fabric? Think again. 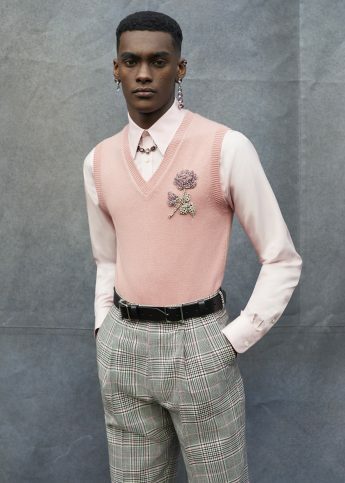 This marks the third season the brand has collaborated with the Woolmark Company, and the result this time around was a colour-block collection with retro elements, all in 100% luxe merino wool. And it was all about local flavour with loud tongue-in-cheek prints, unbuttoned shirts, fisherman knits, and hoodies layered over speedos (of course). Oh, and no shoes allowed. Meet the Jacquemus guy.